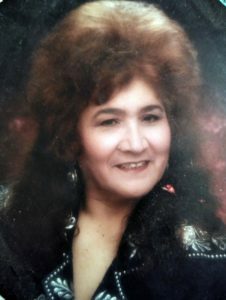 Amelia R. Balderrama age 81 of Devine, Texas passed away on Tuesday, January 8, 2019 in San Antonio, Texas. Amelia is preceded in death by her parents, Pedro Rizo and Juanita G. Rizo; husband, Juan Manuel Balderrama; brothers, Jose Rizo, Pete Rizo, Juan Rizo, and Santiago Rizo; sisters, Sara Gonzalez, Cucca Valdez, and Celia Rizo. Amelia is survived by her sons, Johnny M Balderrama Jr. (Gloria), Frank E. Balderrama; daughters, Maryann Rodiguez (Jose Paul), Gracie Maldonado (Rafeal), Cindy R. Balderrama; sister, Francis Rizo; Eight Grandchildren and Eight Great-Grandchildren. Visitation was held Thursday, January 10, 2019 from 5:00 pm until 9:00 pm with a Rosary recited at 7:00 pm. Hurley Funeral Home, Devine, Texas. Services will conclude at the Funeral Home. Arrangements are under the direction of Hurley Funeral Home, 303 W. College Ave., Devine, Texas 78016, (830) 663-4445.